Laura made her first gluten free cake this week! Needless to say she was pretty nervous. I have never made a gluten free cake before. Frankly I haven’t tasted many gluten free treats that I like either. Barbara over at Gone PIe makes wonderful brownies and cookies and I’ve enjoyed many Babycakes treats as well, but overall I tend to be nervous when I hear a cake is gluten free. I’m always fearful it will be dense and flavorless. The incredibly talented Jenny Bradley who writes over at Vegansaurus, and bakes the earth shattering treats for Source in SF, wrote up a convincingly enthusiastic review of Wholesome Chow’s baking mixes. Wholesome Chow is gluten free, organic, and easily made vegan with the use of a non-dairy milk. They feature some incredible flavors and as my birthday girl is a lover of anything and everything lavender, when I saw Wholesome Chow had several lavender options, that sealed the deal and I decided to try it. Quick n Easy is right! I was blown away by how simple this cake came together and it baked PERFECTLY. The flavor was amazing. I was worried the chocolate might overpower the lavender but it didn’t. 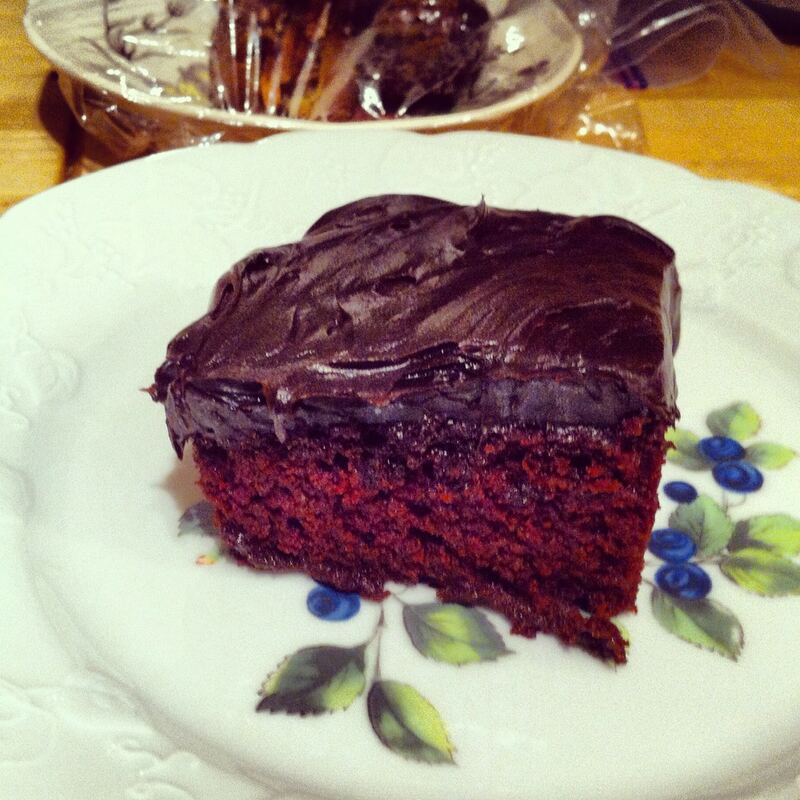 Even with a dark chocolate fudge frosting, the herb rang through beautifully. The birthday girl loved it, and so did everyone else! Her husband and daughter both went back for multiple pieces, it was actually pretty funny to see them devour it so quickly. I liked it too. I liked it a lot. I know it’s wrong to say because I made it myself but it is by far one of the best gluten free cakes I’ve ever tasted. This mix is the bomb! Everyone was gushing about how great it was, I started to feel a little guilty like I was hiding a secret. So LET IT BE KNOWN! Wholesome Chow is an incredible product! I immediately went online and ordered some more of their flavors and I honestly am dying try them. 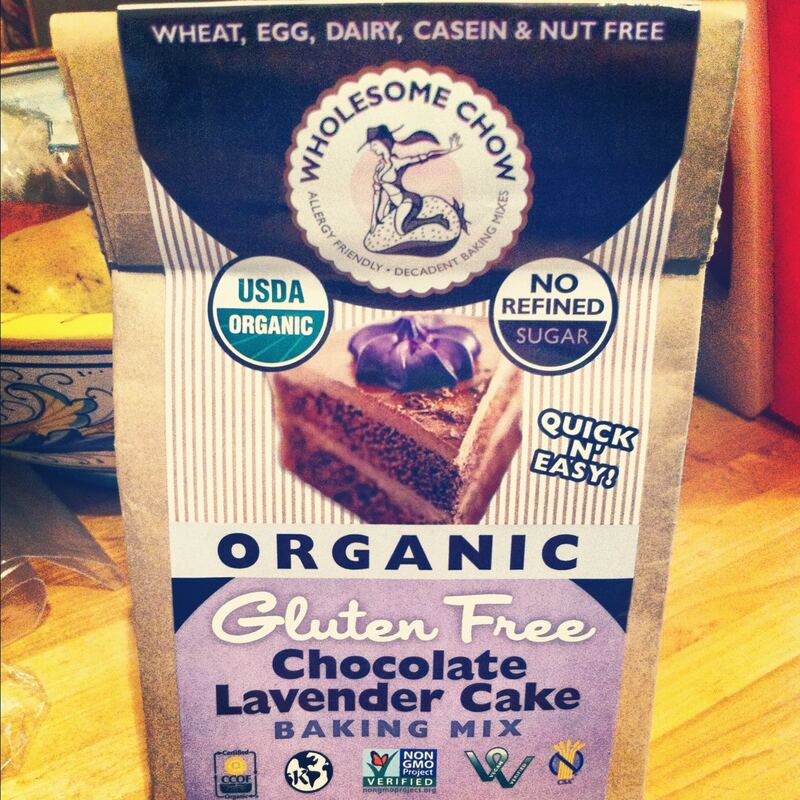 You can order Wholesome Chow mixes for both cakes and frosting directly from their online store. I’ve seen it available in Lunardi’s market, and there is a list of other stores you can find it at. I simply can’t recommend it enough. Who needs gluten?! Big Fat Vegans, you rock! Thanks so much for the awesome review of our products! We are so happy you enjoyed! Thanks for spreading the word! Our pleasure Wholesome Chow! Thanks for making such an incredible product! We love you! I *love* Wholesome Chow – I got the opportunity to try the Chai mix a few months ago and it was killer. I made it in a bread pan and it was gone within 24 hours.